Samsung Galaxy Note 5 Manual User Guide has specially to guide you the functions and features of your Galaxy Note 5. You can download or read here. Samsung Galaxy Note 5 is an Android phablet smartphone developed and produced by Samsung Electronics. The Galaxy Note 5 along with Galaxy S6 Edge+ were unveiled during a Samsung press conference in New York City on 13 August 2015. It is the successor to the Samsung Galaxy Note 4. The phone will be available in the U.S on 21st August 2015. The Galaxy Note 5 design with a metal unibody frame and glass backing instead of faux leather back and a newer stylus made with metal. The back of the device is curved on both sides for easy handling. Due to the newer design of the phone, the Note 5 is the first in the Note series of phones that does not have a user-removal battery (non-removable battery) and no microSD card slot. 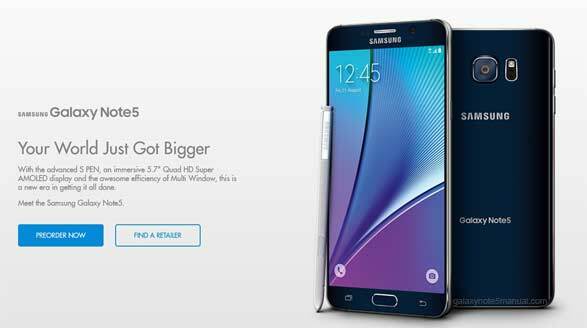 Samsung Galaxy Note 5 will be available in the U.S from 21st August 2015 on all four major carriers in Black Sapphire, White Pearl, Gold Platinum and Silver Titanium, or see here to look all color. However, Samsung have no plans to sell the device in Europe but instead selling the Galaxy S6 Edge+ only.